Ask your family what happened today, and you’ll get one kind of response. Ask the same question in a newsroom, and you’ll hear something quite different. Morton envisioned the show in two parts. One is a quilt made of handwritten notes submitted by several thousand Houston residents, describing what happened on a given day in their lives. 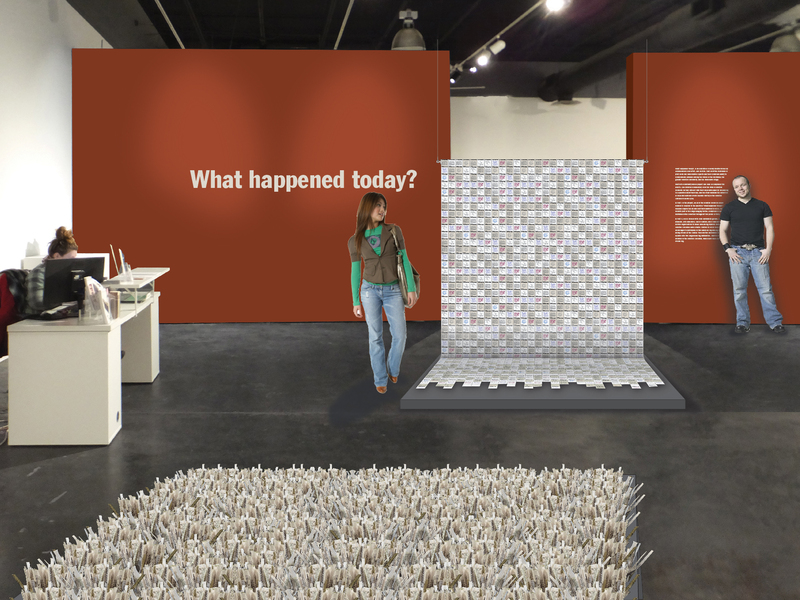 The second installation is a tufted rug made from the pages of the Houston Chronicle, woven by the Phoenix, Arizona, artist and more than 100 Houston volunteers. Morton, 61, believes people are as affected by the incremental shifts in their personal lives as they are by the dramatic events trumpeted by the mass media. We asked her to tell us what she finds so interesting about the juxtaposition of personal and public news. You used the newspaper in this project in two ways. 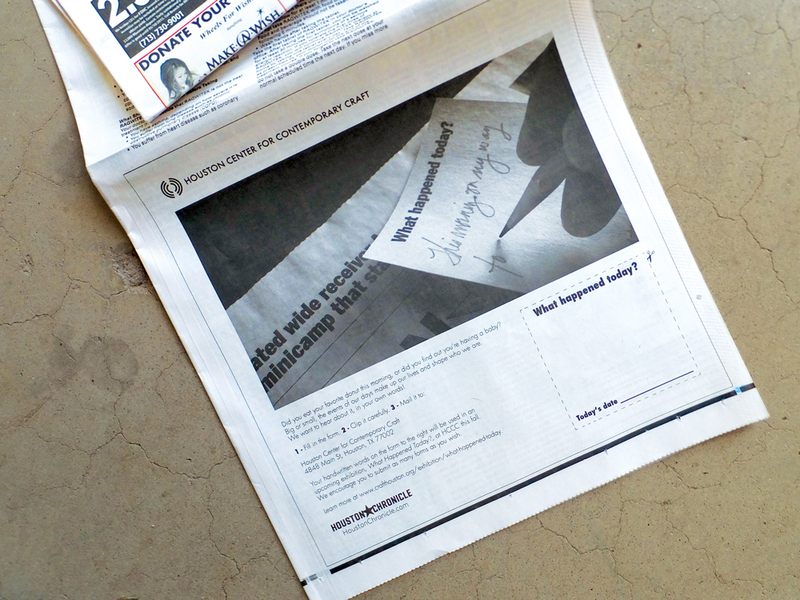 First, you placed ads in the Houston Chronicle asking readers for handwritten notes about what happened on a given day. 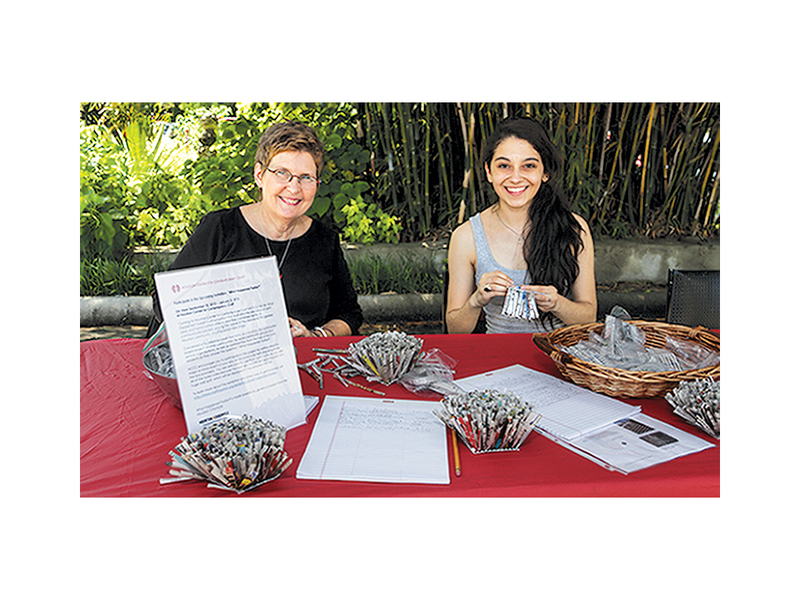 Second, you and volunteers made a rug from pages of the Chronicle. What made you want to partner with the newspaper? The Chronicle provides that critical link to what we all consider the large events of our lives, from the world and the nation –news that’s worthy of print. So the two parts of this work communicate those parallels between the events deemed worthy of the Chronicle’s news cycle and the events from the daily lives of Houston residents that they themselves feel worthy of note. Your project reminds me of a quote by the historian Will Durant: “The history of civilization is a river on whose waters soldiers and politicians are fighting and shedding ballots and blood; but on the banks of the river, people are raising children, building homes, making scientific inventions, puzzling about the universe, writing music and literature.” Does that resonate with you? That quote is so on-point for this project – the idea that “big events” go on, and meanwhile we live our lives. Those things we do to live our lives really have a more profound impact. However, those big events are still permeating who we are as a human race. So the two work together to make us the kind of creatures that we are. Tell us about the notes that came in from Houston residents. There was a note from a woman in prison watching the television show The Enchanted and missing her children. A wife dancing with her husband while cleaning the garage. A couple whose baby had turned over for the first time that morning. 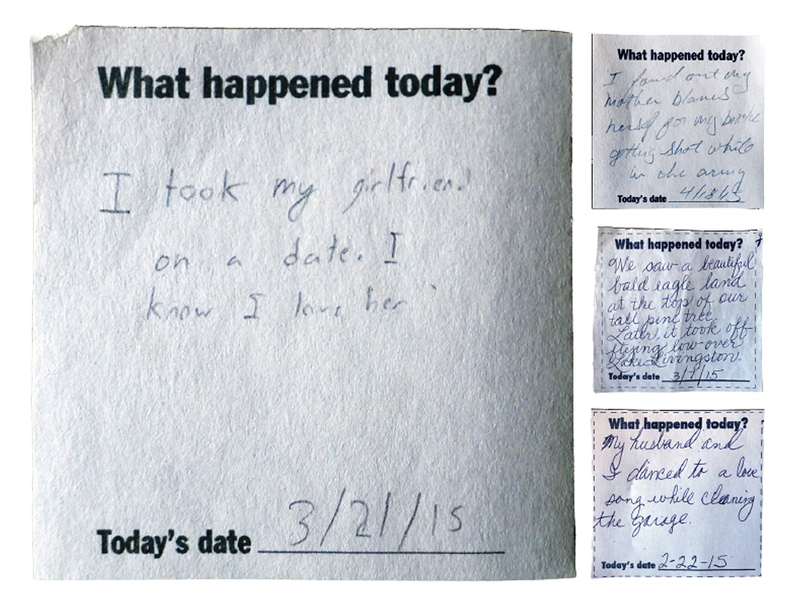 One note had very tiny text, very shy, lightly written: “I took my girlfriend on a date. I know I love her,” it said. One man wrote that he came out that day and kissed another guy. The other component of the show is a rug made of newspaper. How did it come together? About a dozen groups, maybe more – from all over the city, from kids to elders, all socio-economic groups – made these hooked-rug squares that came together to make this really condensed, thick, tufted rug out of the newspaper. This forms a condensation of news, which is so overwhelming at times it’s too much to absorb. You can’t read any of it in the rug. Instead it becomes the “white noise” of the news, in a textural and objective way. It is then juxtaposed with all the personal notes, which you can read and see the personal hand on all of them. So the printed news is not legible, but the handwritten notes are. Why was that important to you? Many times we take for granted the events of our day, the things that happen to us – they’re not the “important” things. However, they may be the most important events. When you have a child, it’s not in the newspaper, but it’s one of the most profound experiences of your life. Or if you get married or get a new job or lose a spouse or a parent. I am turning the “important” upside down: what is printed and what’s not, what is legible and what isn’t. Your projects, including recent ones addressing homelessness, seem to involve many other people. Why are you so interested in community? When I witness people actually contributing to and engaging in the process of making what is finally put on exhibit, to me that is where the heart of a project lies. The object is just the evidence of all the experiences that the work has generated. I went to some of the groups as they were working. And people sit around and talk. They talk about their work and how excited they are. Those conversations, those connections, those experiences are all part of this project. And that is what I find the most wonderful part.